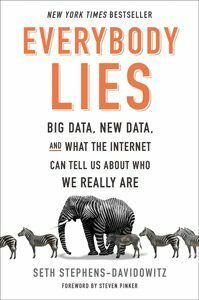 Everybody Lies upends what we think we know is true, letting what author Seth Stephens-Davidowitz calls “big data” – derived from our internet footprints – reveal what lies behind what we tell each other and ourselves, and even what we report on anonymous surveys. While our internet presence may uncover truths that psychology, neuroscience, “common sense,” and public surveys have not, it is not foolproof in producing knowledge and “truth”; yet many assumptions and ideas we have about ourselves, our behaviors, and our thinking are challenged in this fascinating and thought-provoking book. One of the reasons this book is so useful to us as educators is that it reminds us to promote critical thinking ever more vigilantly; to remember (and teach) that correlation does not equal causation; and to resist assumptions that may seem obvious, but which may, in fact, be wrong.